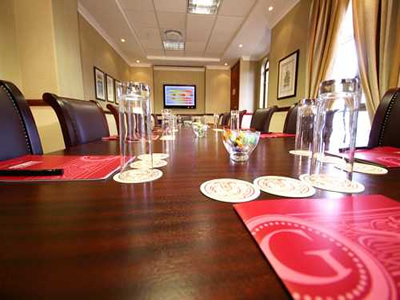 The Grace / Pembi Rosebank Conference Centre is located on the second floor of the hotel and is the perfect place for executive meetings and conferences. There are currently five conference venues ranging in size and seating capacity. With an emphasis on first class service, true to its worldwide reputation, The Grace / Pembi Rosebank Conference Centre offers all the high tech, state-of-the-art equipment necessary to host a successful conference, including data projectors, televisions and video facilities. In addition, the venue boasts its own stand alone kitchen and banqueting facilities on the same floor. Parking is available on the top floor of the adjacent Mall in Rosebank, with easy access via the adjoining sky bridge. With its classical standards of excellence dating back to an era of gracious living and attention to detail, The Grace / Pembi Rosebank Conference Centre is the ideal choice for guests seeking a sophisticated Johannesburg lodging city hotel with the highest levels of service and luxury, as well as personal charm found only in small establishments. Set in the heart of stylish Rosebank, a tree-lined cosmopolitan suburb rich in eclectic restaurants, shopping centres, cinemas and culture, The Grace / Pembi Rosebank Conference Centre offers easy access to Johannesburg's most prominent business and cultural museums, as well as O.R. Tambo International airport. With only 73 rooms, The Grace / Pembi Rosebank Conference Centre is a sophisticated boutique styled Johannesburg hotel with the highest standards of personal service and luxury. It has deservedly received countless international awards from organisations including Condé Nast Traveller and Diners Club. An enclosed sky bridge links The Grace / Pembi Rosebank Conference Centre to the Mall of Rosebank, perfect for the avid curio shopper, while the unique 4th floor garden terrace and pool deck offers refuge for those who prefer to bask in the African sunshine or sip a refreshing cocktail alongside the pool. The Grace / Pembi Rosebank Conference Centre is proud to offer a further value-added facility: the Club Floor, which is situated on the 5th floor of the hotel. The Grace Club Floor is geared towards guests wishing to experience closer personal service which includes priority booking during peak times, 18 hour butler service, VIP room check in, a gift from The Grace Collection, exclusive use of the 5th floor lounge, a complimentary night cap and more. Renowned for its’ high levels of sophistication and elegance, The Grace / Pembi Rosebank Conference Centre boasts an array of both local and international nominations and awards. A number of reputable magazines have praised the hotel’s impeccable service, conference venue and dining room, namely Conde Nast Traveler USA, 2009 Reader’s choice Awards, Top 100 restaurants by Wine Magazine for three successive years and most recently Travel & Leisure USA for ‘The World’s Best ’ in service within the Africa & Middle East category for 2007. With uncompromising standards in excellence and service, The Grace / Pembi Rosebank Conference Centre is celebrated worldwide as one of the most distinguished hotels in Africa. The Grace / Pembi Rosebank Conference Centre offers a wide range of in-room facilities which guests expect to find in a five star establishment. Our tea and coffee station enables guests to enjoy a beverage at their leisure and they are free to partake at any time from the range of hygienically packed snacks and/or fully stocked mini bar which have been placed in each room. Our rooms at The Grace / Pembi Rosebank Conference Centre offer sophisticated, understated elegance with a great deal of thought and attention which has been applied to each individually decorated room. The rooms are situated from the 5th floor to the 10th floor of the hotel and as guests exit the elevators on each floor, they are welcomed into the atrium by impressive paintings by Gerhard Batha, who was commissioned to create these great works of art for the enjoyment of our guests. We offer smoking rooms on the 9th floor - all our other rooms are non-smoking. 10 individually decorated suites, each with adjoining lounges and guest toilets. Upon exiting the airport, keep to the right, following the signs for the R24 / Johannesburg. This road joins the highway. Continue straight on the R24 (N3) / Johannesburg. Nine kilometers after leaving the airport, move into the centre right lane. You will then merge with the N3 highway. Follow the signs for the N3 / N1 / Pretoria. Take the fork to the right. Immediately after this fork, turn left on to the interchange, and continue following the N3 / N1 / Pretoria signs. Take the first offramp to Linksfield Road. At the traffic light, turn right into Linksfield Road. At the second set of traffic lights, turn right into Club Road. After passing the Huddle Park Golf Course on your left-hand side, you will cross over Modderfontein Road. Continue along Atholl Avenue, crossing over Louis Botha Avenue. When you reach a T-junction, turn right into Pretoria Road. Pretoria Road becomes Glenhove Road. Continue along Glenhove Road, crossing over the highway. Cross over Oxford Road (MacDonalds on your right) At the third set of traffic lights, turn right into Sturdee Avenue. You will then see the entrance on the left-hand side.